The PhorsePOV by [Julian Skidmore] almost slipped by, but we thought it was a nice easy hack for your Memorial Monday. The gadget uses an ATTINY25 to drive 6 LEDs aren’t standard characters 7 units high? Which when waved in the air produces a readable message. What we were really interested in is the use of a single button for text entry, called Phorse code, or an “easier to learn and remember” version of Morse code. While it seemed silly at first, most of us here could enter messages within a few minutes of trying. Inventing a nonstandard form of Morse code for this does a disservice to the user, who could with a similar amount of effort be acquiring a habit that is actually useful for other things. I’m very unimpressed with this article and the corresponding links. I’m assuming that in order for us to learn anything about this project we’d have to actually download the .zip contained on the website, and I can’t be bothered to download something with such a lack of information presented. For how much HackaDay does for it’s readers (showcasing multiple hacks very day, responding to readers’ comments, citing multiple sources, making relatively few mistakes, etc. ), all free of charge, there sure is a lot of complaining going on. This hack works. It’s simple. Honestly, there’s not that much to be explained. HackaDay posted it here for people to see if hey wanted to. Nobody is obliged to. I hardly ever post comments here, but I’m getting kinda tired of all the negativity HackaDay and the creators of the hacks are receiving. Let’s be respectful, guys. Seriously. Also, if you can’t quickly review a 226k zip file, then damn, brah, I dunno what to say. Aw pish off you lot, it is completely reasonable to expect internet content you read to be understandable without having to download an opaque binary of any size. In that 226k zip file, there is a folder called”hardware” and one called “Docs”. If you open those, you get a PDF with clear photos of the finished board, as well as postscript files of the board. The code is well commented if you had any questions. I’m sorry Comrade, but you really can’t expect everyone to build a webpage for their project. It very well may take them longer to make a page than to put this circuit together! I agree the target Web page is a little sparse, but the .zip was easy to download and contained enough to understand what’s going on. I like it. Now I wonder if I can get this to run on an ATtiny13… Hmmm. I guess you can only wave this in one direction? What idiot would not use morse code? I think it’s cool that he’s doing this so simply and cheaply, and it’s documented well enough for those who aren’t daunted by the sheer size of the zip file (seriously, you running a 486 and talking to the net through 12K dialup? Points for retro, grampa.) I do think it’s unfortunate that he’s using non-standard code. The only mention of ‘phorse code’ google knows about is this very article, so it either grows virally or dies with this particular tinkerer. I’m betting on dies. @fartface Given your handle, I doubt you are being serious, but I’ll respond anyway. 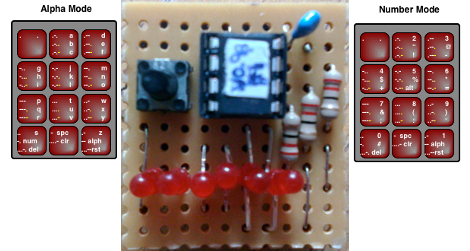 The morse code concept is only used so that he can implement user input with the fewest components, and therefore make the design incredibly small and cheap. @Brennan I think the problem here (and fartface’s original concern) is that the creator used a one-off of Morse code, rather than just using standard Morse code itself. To operate this device, you’ll need to learn this nonstandard code that really isn’t useful for anything else. @argyle, I must have read the post wrong – for some reason I thought he was talking about the hardware. It makes more sense now that I reread it. I wonder if the modified code is a result of the firmware design. I haven’t looked at it but perhaps his code was designed such that this modified code works better than standard morse code. I agree it’s a bizarre way of going about it. Comrade made a good point, this is very little info and you might as well link to google and say ‘here you find some hacks’, it’s getting too minimalistic, but not naming this link isn’t helpful either, so perhaps a feature that collects such links in a single article once in a while? I’m not bashing this project, far from it. I downloaded the file and everything is there including some great documentation (kudos to the creator), but a little more explanation could have been provided prior to downloading. I guess I’m used to seeing hacks written up in articles as opposed to multiple files in an archive you have to download. In my original post I was more worried about the sheer lack of info and those other random links (Morse code, HaD POV), but also included my concern at the lack of info the creator’s web page. I’d also like to see a video of this in action. “Phorse” code, unlike morse code, does have a pattern to it, based on a familiar object – a phone keypad. So for someone unfamiliar with morse code, Phorse would be easier to learn. Personally, I’d just replace the switch with an IR decoder, and use an IR remote of my choice to program it. Still just one pin on the MCU, little more space on the actual POV board, and the firmware would be comparable. But I can also imagine situations where this simple control scheme would be genuinely useful. Suppose I built a text display into a Halloween costume, and wanted to program the display at will, without using my hands or any other detectable means of programming. Phorse and a toe switch in the shoe would make it possible! What a bunch of nasty comments from a bunch of tire kickers who will never build a project like this anyway! Lol!!! Building as we speak, will post video and link when finished. A library for doing one-button or two-button morse input for AVR would be nice. The http://k1el.tripod.com/K12.html device is designed to send morse code, so it’s a natural already, but it’s configuration is done through send it morse code. You send “S” to set the speed, etc.